I read the following online: If you plug in both USB power (say from a pc) and external power via the 2.1mm jack, the Arduino chooses power source automatically. If the external 2.1mm DC is providing greater than 6.6V, the Arduino will take power from it instead of the USB. Secondly, my real question: If I am powering my Arduino via external DC, can I still communicate with my Raspberry Pi using serial via the USB? Yes you can. It still leaves the data/ground lines intact, it just doesn't bridge the 5V line. 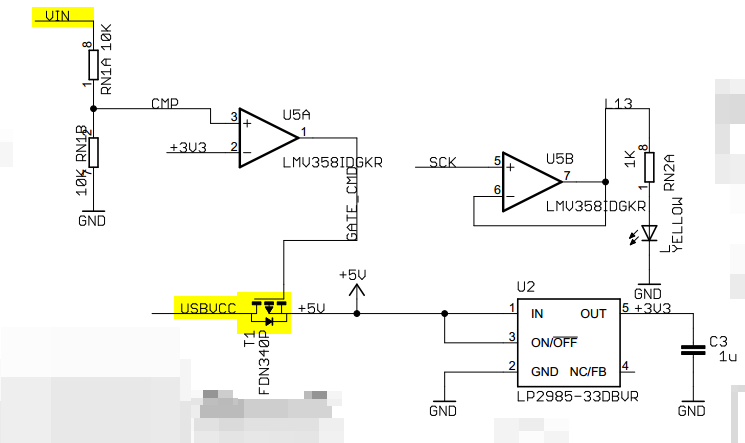 The USBVCC is directly from the 5V on the USB jack (well, technically there's a fuse there). It then goes through a transistor (T1) that only allows power through when there is no power coming from the 5V regulator (that regulates the VIN voltage). You can see pin 1 of the USB jack (5V) goes through the fuse to USBVCC. The next ones D+/D- are the data lines that go through resistors to the ATMEGA16U (used for USB to UART). The last one just ties into ground. Not the answer you're looking for? Browse other questions tagged serial power or ask your own question.